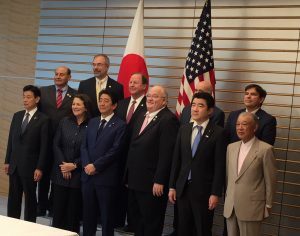 Seven members of the U.S. House of Representatives participated on a tour of Japan in late February through the Congressional Study Group on Japan (CSGJ), sponsored by Sasakawa USA. The delegation arrived in Tokyo on February 18 to embark on a week-long trip to enhance their understanding of Japan. The trip included meetings with Japan’s Prime Minister Shinzo Abe and Ambassador Bill Hagerty, the U.S. Ambassador to Japan. The delegation included CSGJ House co-chairs Diana DeGette (D-CO-1) and Billy Long (R-MO-7), along with Representatives Lou Correa (D-CA-46), Bill Flores (R-TX-17), Vincente Gonzalez (D-TX-15), Andy Harris (R-MD-1), and Mark Pocan (D-WI-2). The members toured the Kantei, the Prime Minister’s Official Residence, where the members met with Prime Minister Abe. Throughout the week, the delegation participated in discussions with various government officials, including incoming Japanese Ambassador to the U.S. Shinsuke Sugiyama; Minister for Foreign Affairs Taro Kono; Defense Minister Itsunori Onodera; and Japan Self-Defense Forces Chief of Staff, Joint Staff, Admiral Katsutoshi Kawano. 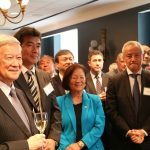 The delegation also attended a networking reception with Japanese Diet members, highlighting the importance of sustaining the U.S.-Japan relationship. Ambassador Bill Hagerty, the U.S. Ambassador to Japan, sat down with the delegation for a meeting, followed by a briefing at the U.S. Embassy led by Deputy Chief of Mission Joe Young. During the trip, the delegation met with ambassadors and deputy chiefs of missions from four Association of Southeast Asian Nations (ASEAN) member countries—Malaysia, Singapore, Thailand, and Vietnam—to discuss multilateral cooperation in Asia. In addition, the delegation delved into topics of trade and the economy with the CSGJ Business Advisory Council and representatives from American companies in Japan, including Lockheed Martin, Raytheon, and Boeing. The tour of Tokyo included discussion sessions with government officials, professors, and other experts on a variety of topics including: “Womenomics and Demographic Change in Japan” and “Security in Northeast Asia.” They also met with Tokyo-based journalists from Kyodo News and the Financial Times for a discussion about Prime Minister Abe’s agenda. To experience a taste of Japanese culture, the delegation visited Meiji Jingu Shrine, where they learned about the influences of Buddhism and Shintoism on Japan from a shrine priest. For their last stop in the Tokyo area, the delegation visited Yokosuka U.S. Naval Base, where they were briefed on the U.S. Seventh Fleet and toured the base with Captain Jeffrey Kim. The members then participated in a lunch conversation with students from Kinnick High School on the base. Sapporo, the capital city of the northern prefecture of Hokkaido, was next on the itinerary for a meeting with Rachel Brunette-Chen, the Principal Officer of the U.S. Consulate General Sapporo. The following day, Hokkaido Governor Harumi Takahashi talked to the delegation about local politics and Hokkaido University Professor Teruki Tsunemoto spoke with them about the indigenous Ainu people of Japan. They also visited the Hokkaido Museum. Sasakawa USA sponsors the Congressional Study Group on Japan, which allows delegates to complete an enriching experience and deepen their understanding of U.S.-Japan relations in a short amount of time.